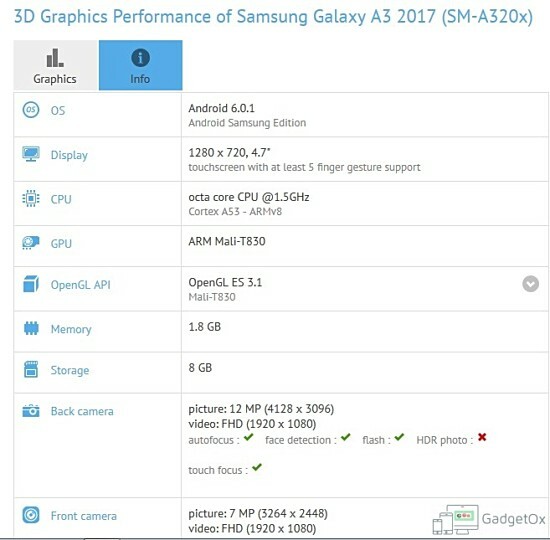 Shortly after the Samsung Galaxy A7 (2017) was spotted on GFXBench, the Samsung Galaxy A3 (2017) has also surfaced on the benchmarking website, revealing some of its key specifications. As per the listing, the device is powered by an octa-core 1.5GHz processor, and sports a 4.7-inch HD display. Keep in mind that benchmarks sometimes do get their display size estimates wrong, but that seems less likely here as the 2016 edition of the device also featured a 4.7-inch screen. Moving on, RAM is 2GB, while internal memory is 8GB. In terms of camera, the phone features a 12MP rear unit and an 8MP front shooter. It runs Android 6.0.1 Marshmallow out of the box.